Beth Kirsch, Director of Online Marketing for Lower My Bills recently wrote about Web 2.0 and Affiliate Marketing on Revenews. There has been some debate over how much affiliates can utilize 2.0 technologies to drive sales for merchants through RSS, Podcasts and blogs, but I think the power behind web 2.0 is much greater than just these 3 technologies. 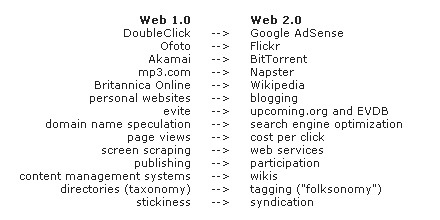 First we need to start with just what the heck is web 2.0? The best source for 2.0 information seems to come from it's "creator" Tim O'Reilly. According to this article written in September of 2005 the concept of web 2.0 began as a brainstorming session that O'Reilly was part of. So what does all this have to do with Affiliates? If you ask me, affiliates have been living the 2.0 life since the days of 1.0. They understood that it didn't take millions of dollars in Super Bowl ads to generate sales for the merchants they promoted. Affiliates had to get creative in the way they utilize technology to build, manage, and market sites. They were among the first to jump into the paid search arena when GoTo.com launched back in 1997, mainly because it delivered the best ROI. Web 2.0 companies are based on a foundation of simplicity and functionality rather than smoke, mirrors, and oodles of VC cash. One of the most compelling aspects of web 2.0 is the idea of web services and API's. We're clearly moving towards a more collaborative tech environment and its changing the way we do business. Companies like SalesForce.com have developed an open platform that allows anyone to build a piece of technology that easily can plug into their system. Skype already has dozens of applications that offer additional functionality they didn't think of or have time to develop. It's a shame that the larger affiliate networks haven't grasped this concept and opened up their back end to let creative people build applications around their technology. Smaller affiliate companies like DirectTrack and MyAffiliateProgram have this functionality and I think it has fantastic potential. It's no surprise to me that 2 of the largest and most successful affiliate programs of all time Amazon and Ebay have each launched very successful web services platforms for affiliates. In the coming weeks I plan to talk about some of the more intriguing technologies that the web 2.0 generation has to offer. Be sure to subscribe above to be notified of updates.